The parish of Litcham is northwest of Dereham and northeast of Swaffham. Litcham village is located in the south, close to the River Nar and Litcham Common. Isolated farms and houses are scattered throughout and include High House Farm, close to Litcham Heath in the northwest. The archaeology of Litcham is fairly well known. There have been many stray finds, metal detecting and fieldwalking have taken place and a few excavations have been conducted. Some sites have been identified on aerial photographs, site visits have been undertaken and many historic buildings survive. Although sites are recorded throughout the parish, most are concentrated in the areas around the village and Litcham Heath. No sites are known from a large area in the centre. A few prehistoric flint artefacts have been found. They include a Mesolithic or Early Neolithic scraper, a Neolithic polished axehead, a Neolithic laurel leaf and a possible rubbing stone (NHER 13542) that was found set into a floor at the Bull Inn. A group of undated shallow depressions (NHER 3703) were recorded on Litcham Heath in 1941. They could have been infilled Neolithic flint mines similar to those at Massingham Heath and Grimes' Graves, although it is also possible that they were the remains of Early Saxon grubenhauser (sunken featured buildings). A Bronze Age round barrow (NHER 3701) may survive on Litcham Heath, to the east of several upstanding examples in Weasenham All Saints parish. In 1991 it was about 0.9m tall and in 1938 an excavation revealed a burnt area and a stone object. A mound (NHER 3702) recorded to the east of the barrow during the 1930s, 1940s and 1970s may also have been a round barrow. The same is probably true of four ring ditches visible nearby on aerial photographs and a mound in the northeast. The northeastern mound (NHER 12069) may have had a medieval windmill built on it. There is a Bronze Age disc barrow (NHER 31522) on Litcham Common, one of only a few in Norfolk to survive. The Roman road (NHER 2796) from Denver to the Roman town at Brampton passes along the southern edge of Litcham Common and part of the southern parish boundary follows its course. The north to south road (NHER 3697) from the Peddar's Way to Toftrees Roman settlement probably passed through the centre and may have met the Denver to Brampton road in the south. A Roman feature (NHER 1106) found in 1973 in the northeast could have been located close to the north to south road. It was one of five pits or ditches revealed during the cutting of drainage ditches. Artefacts collected from the site include Roman pottery, a linch pin, a finger ring and coins. Pottery and coins have also been found at sites dotted throughout. Few Saxon artefacts have been recovered. 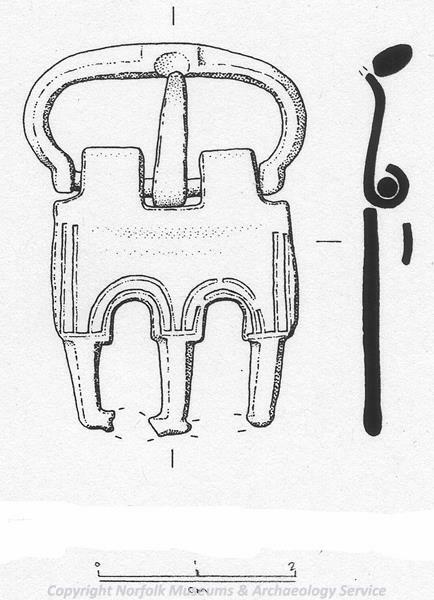 Two Early Saxon brooches come from the south, with Late Saxon pottery found in the village within the churchyard of All Saints’ Church (NHER 4091). A church recorded in the Domesday Book of 1086 probably stood on the site of the present All Saints’, most of which dates to around 1300. Sections of south aisle, the chancel arch and some of the windows were added in 1412. The brick tower was built in 1669. Litcham is called ‘Licham’ in the Domesday Book. This is probably an Old English word meaning ‘the homestead with an enclosure’. King William I and Hermer held the land in the parish. Just to the south of the village is Priory Farmhouse (NHER 4072). It contains the remains of a 14th century religious building, possibly a chapel or a hermitage. 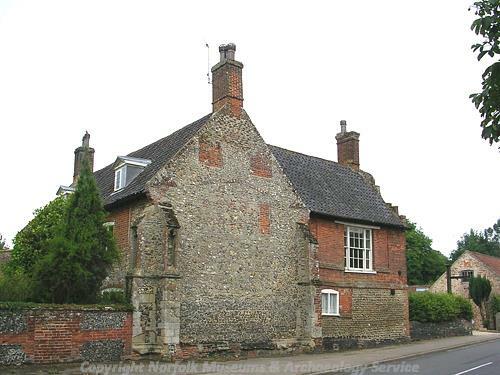 In the 16th century this building was converted into a house and it has been altered and extended on many occasions since. To the northwest a moat survives, although most of its south and east sides have been infilled and houses now stand within it. Medieval walls, pottery and a large feature, possibly the south side of the moat, were found during building work. A second moated site (NHER 15535) is located to the east of the village, along with a medieval and/or post medieval trackway. There is a late medieval tithe barn (NHER 13543) in the centre of the village. It has a timber frame that may be 16th century in date and is described in a document of 1613, along with other buildings in the parish. There were two medieval crosses on Litcham Common, but neither survives and the places where they stood are uncertain. In 1414 Sir Thomas Erpingham and Thomas Earl of Arundel argued about who owned them. Medieval and post medieval artefacts have been found at sites all over the parish. During the 19th century a hoard of over 300 silver medieval coins (NHER 14757) was found behind the King's Head. The coins were all inside a jug and were minted during the reign of Edward III. One coin was of David II of Scotland. Surviving historic buildings include Manor Farm, The Bull Inn, 12 Church Road, High House Farm, Litcham Hall, the School House, White House, Oaklands Farm, Point House, 1 Tittleshall Road, Blenheim House and Fourways. All but two, High House Farmhouse and Oaklands Farmhouse, are located in the village. Manor Farm (NHER 19581) has a late 16th century timber frame and The Bull Inn (NHER 13542) is a massive 17th century and later building. Lexham Hall Park (NHER 30469), a late 18th century landscape park, occupies a small part of the west. During the 18th and 19th centuries there was a windmill (NHER 18884) to the northeast of the village. Two post medieval lime kilns, a possible railway embankment and chalk quarry pits survive to the northeast of the village. In the 19th century there was a set of stocks in the south, beside the bridge over the River Nar. Close to All Saints’ Church is a telephone kiosk built to a 1935 design of Sir Giles Gilbert Scott’s. David Robertson (NLA), 16 May 2006.